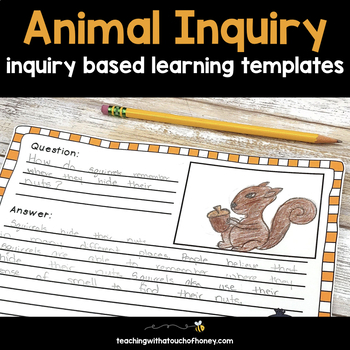 The animal inquiry project package is a great way to support your grade 1, grade 2, grade 3, and homeschool students as they begin learning about the inquiry process. It is also a great way for students to practice using inquiry based learning. 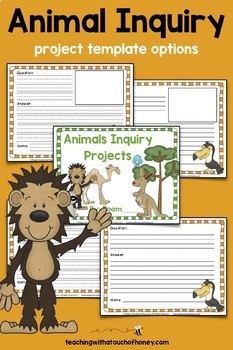 Use this five step inquiry process to practice the inquiry process during a unit on animals. Great for English language arts, science, writing, centers, stations, group work, KWL, projects, research, and MORE! Get your class asking questions, brainstorming, and learning! Want even MORE inquiry resources? Check out these blogposts to get your FREE inquiry planning checklists for teachers and inquiry differentiation chart. save planning time by using the NO PREP templates and materials. support your students with learning the inquiry process. create engaging bulletin boards and beautiful class books with very little preparation. create projects they can be proud of. build self-confidence as they work through the simple 5 step process. ➜ a variety of color and black/white posters that you can hang in your classroom so your students can reference them as they work through the inquiry process. ➜ sample inquiry questions that will provide your students with actual examples they can use to model their own questions. ➜ blank inquiry question cards so that your students can add their inquiry questions to bulletin board displays. ➜ color and black/white NO PREP templates for students to use to complete their research and showcase their findings in a class book. 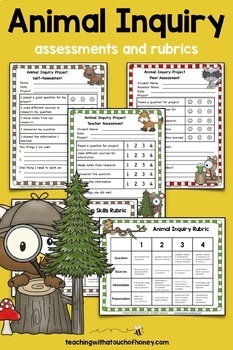 ➜ self, peer, and teacher assessments, a student reflection, and rubrics to provide you with data about student learning and allow students to set goals and improve future projects. ➜ color and black/white NO PREP research and final copy templates to save you planning time and make it simple to begin using inquiry with your students today. ➜ and so much more! ✱ grade 1, 2, and 3 classroom teachers to support students as they learn about and practice using the inquiry process. ✱ special education teachers to provide support to students with inquiry based projects. ✱ homeschool parents so their children can use the materials to complete inquiry projects at home. 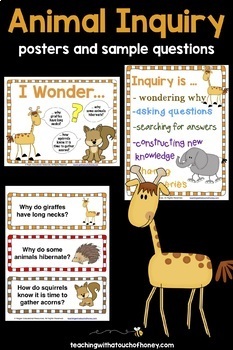 ✱ want your students to practice using the inquiry process. ✱ are looking for activities to use as enrichment for students who need to be challenged. ✱ want activities for early finishers that align with curriculum outcomes or standards. ✱ have students who need additional supports to be successful. I was overwhelmed when I first began thinking of how I would introduce inquiry to students in my classroom. I was frustrated by all the little details I seemed to forget about in my planning. I’ve been working with this process for years now, and have been updating and adding to my inquiry resources whenever I discovered a new way to make the process easier for students. I also listened to the frustrations of other teachers to make sure my resources fit their needs perfectly. I’ve discovered the key to teaching inquiry to students in a simple, straight-forward manner. Students learn the process, discover new information, have fun presenting what they learn, assess their projects, and set goals to improve the next time they complete an inquiry project. … without having to spend the time and frustration of figuring out the inquiry process on your own. Do you want writing freebies that you can start using with your students that are not found anywhere else? Are you interested in receiving exclusive deals, discounts, and freebies that will save you time and make your planning easier? Are all the materials I need included in this bundle? The only other materials you will need are books, magazines, or access to the internet. Students will need a source of information to find the answers to their inquiry questions. ​Do the materials allow for differentiation? There are two types of templates provided. Some templates have regular lines and some have primary lines. You can easily build additional differentiation into these materials by the expectations you set for your students. If you have students that find it hard to focus or have low writing output, you may require them to only consult one source for information. If you have students that need to be challenged, you may require them to consult two or three sources of information as well as writing an exciting introduction and a concluding sentence or paragraph. Remember to leave feedback to get credit on your future purchases! Follow me to find out about new products and discounts that you can use to support the different learning needs of the students in your classroom!